The AMSOIL GM 6.6LSingle-Remote Bypass System provides superior filtration performance for GM 6.6L engines while working in conjunction with the engine’s full-flow oil filter. This system connects to the engine through a full-flow filter adapter and oil fill port. System includes mount, mounting hardware, EaBP90, hose and hose fittings. Note: Full-flow filter not included with this system. Engineered for outstanding oil filtration efficiency, AMSOIL EaBP Bypass Filters have an absolute efficiency (Beta 75) at TWO microns and 60% efficiency at submicron levels. As a result, it is also an SMD (soot removal device). This system provides the best possible filtration protection against wear, oil degradation, rust and corrosion for GM 6.6L diesel engines. The AMSOIL Bypass Filter typically filters all the oil in the system several times an hour, so the engine continuously receives analytically clean oil. It is like changing your oil approximately every 10 to 15 minutes! This system will also increase oil sump capacity by approximately one quart. The BMK27 Dual-Remote Bypass Filtration System is also available for this application. degradation. 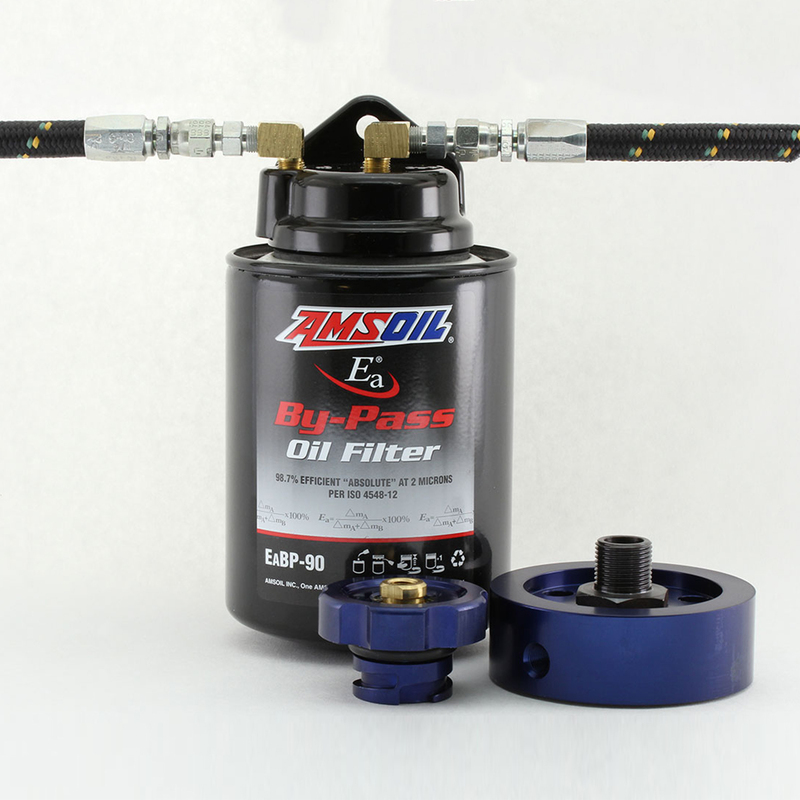 Working in conjunction with the engine’s full-flow oil filter, the AMSOIL Ea Bypass Filter operates by filtering oil on a “partial-flow” basis. It draws approximately 10 percent of the oil pump’s capacity at any one time and traps the extremely small, wear-causing contaminants that full-flow filters can’t remove. The AMSOIL Ea Bypass Filter typically filters all the oil in the system several times an hour, so the engine continuously receives analytically clean oil. AMSOIL EaBP Filters have an efficiency of 98.7 percent at two microns. At normal operating RPMs the EaBP Filter will filter all of the oil in a typical five quart sump in less than 10 minutes; around 20 minutes for larger crankcases. AMSOIL Bypass Filters can be utilized over an extended period of mileage, hours or years as outlined in the Chart below. Oil analysis is recommended for extended drain intervals. AMSOIL has designed a high-efficiency bypass filter element that is also a soot removal device. 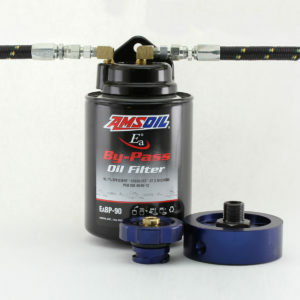 AMSOIL Ea Bypass Filters use a synthetic/cellulose sandwiched media. The inner layer of the element is composed of a highly efficient cellulose media covered with a full synthetic media outer layer. These filters remove 39 percent of soot contaminants less than one micron. Soot removal efficiency increases approximately 10 to 14 percent when the EaBP Filter is used in conjunction with a standard full-flow filter.